It was another wonderful holiday season spent with friends and family. We started out this year at Mr. T’s parents where we enjoyed some fantastic beer and wine. 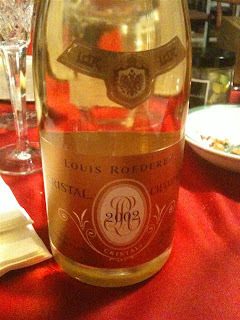 To celebrate our engagement, Mr. T’s brother bought us a bottle of 2002 Cristal to celebrate with! 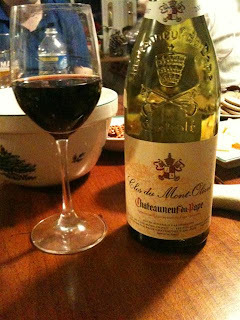 Another fantastic treat we enjoyed was a bottle Clos du Mont Olivet Chate Chateauneuf-du-Pape. I’ve been a big fan of Chateauneuf-du-Pape’s lately and this one did not disappoint. It had big notes of cherry and leather with hints of tobacco. There was a lot more wine we enjoyed throughout our stay but these two obviously jumped out. Mr. T and I brought some Dogfish Head Sahtea for everyone to enjoy and a bottle of Westy 12 for his father’s birthday. Not to shabby for the start of Christmas! Can you imagine if we could drink like this all of the time! Wouldn’t that be nice. To top it all off we went to Buffalo to visit my family and got two gift certificates there- one to Peter Lugers and one to Dinosaur BBQ! Looks like we’ll be enjoying some excellent dinners of meat this coming year! Woohoo! !